Theresienstadt (Terezin in Czech) was founded in 1780 as a fortress town to the North of Prague and was intended for a population of 7,000, half of it soldiers. After Czechoslovakia was occupied by Germany (March 15, 1939), a ghetto was established in Theresienstadt on November 24, 1941. Allegedly for Czech Jews, it was, in fact, a concentration camp and a staging point to the death camps in Eastern Europe. At its peak (September 1942) 58,491 prisoners were crowded into the ghetto and it functioned until its liberation by the Russian army on May 8, 1945. Out of 160,000 prisoners from Czechoslovakia, Germany, Austria, Holland, Denmark and other countries that passed through Theresienstadt between 1941 and 1945, about 35,500 died in the ghetto from hunger or disease. About 90,000 were deported from there to extermination camps and out of these about 4,800 survived. 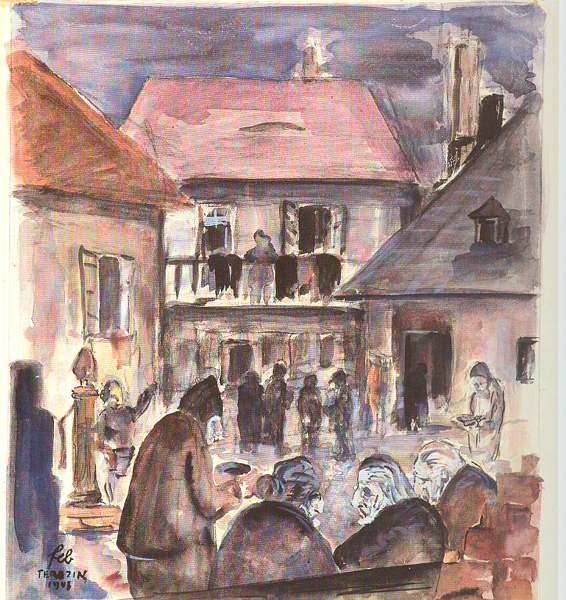 on the day of liberation there werde about 30,000 Jews in the Ghetto. Of the 12,121 Jewish Children born 1928-1945 and sent to Ghetto Theresienstadt – whose future was uppermost on the mind of the Jewish leadership – 9,001 were deported to extermination camps in the East, of whom 325 children survived. The leadership of Czech Jewry headed by Jacob Edelstein supported the establishment of the Theresienstadt ghetto in October 1941, when emigration became impossible. Edelstein, appointed as “Jewish Elder” of the ghetto, believed in “rescue through work” and hoped that concentrating Jews within the Protectorate of Bohemia and Moravia (today the area of the Czech Republic) would prevent the deportation from the ghetto and keep them safe until the Allies would win the war. The difficult conditions in the ghetto were in sharp contrast to everything the Germans had promised. In January 1942 the illusion was shattered, when transports from Theresienstadt to the East commenced and 16 Jews whose crime was sending letters to their families, were executed by hanging. Ghetto Theresienstadt had a special character – the Germans wanted to turn it into a ghetto for old and deserving people from Germany and Austria and use it as a “model ghetto”, a tool in their propaganda efforts. In spite of the difficult reality in the ghetto, the Jewish leadership succeeded to maintain up to a certain point services of health, food distribution, living quarters, work organization, to foster cultural and sport activities and to take care of education of children and youth. Toward a visit of a delegation of the International Red Cross on June 23, 1944, in Theresienstadt, the operation “ghetto beautification” was carried out. Under threat and heavy pressure, the Jewish leadership and the prisoners participated in the German deception, hiding the real conditions in the ghetto – hunger, overcrowding, diseases, high mortality and transports. Afterwards, in the summer of 1944, a propaganda film was shot in the ghetto, continuing the fraud. After the filming about 18,000 ghetto prisoners were deported in September and October 1944 to Auschwitz – most of them perished. Towards the end of the war in 1945, the ghetto became the destination of “death marches” for many thousands who were brought from extermination camps in Eastern Europe.